A cool January morning started off with the sound of hundreds upon hundreds of geese honking in the background and snow crunching beneath our boots as we walked to our spot. Open water in the distance, but a solid 4-6 inches where we were set up. Nobody in our group could have guessed the success we were about to have that day in the 3rd Annual UW-Whitewater Ice Fishing Jamboree on Beulah Lake! 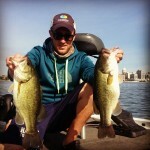 When it comes to fishing, I think anglers should always be watching and learning from other anglers. 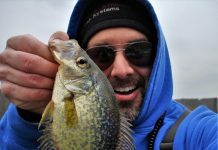 I’m not too proud to admit I’m relatively new to the ice fishing gig, and frankly I’ve been trying to get out on lakes with all kinds of folks to learn some ins and outs of the game. That particular day I happened to be out with a plethora of fishermen with a variety of skill levels. Some were experienced veterans, some were weekend warriors, and some were, well, lets just say they don’t fish a lot but they can sure drink beer with the best of us. And, they made for most of the laughs throughout the day! When it came down to it, we all learned quite a bit. First off, I learned how to set up tip-ups differently than I had in the past. 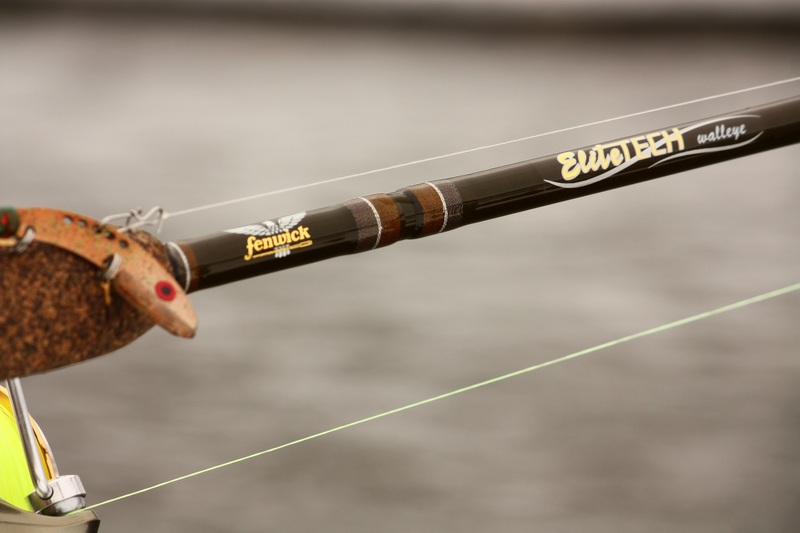 There are many ways to set them up, but when the bite is tough, and you’re targeting big fish, it’s crucial to fine-tune each part. Flourocarbon leaders connected to the tip-up line make the bait seem to struggle and look vulnerable. Usually something in the range of 30lbs is a good starter, and I choose flourocarbon over monofilament because it doesn’t stretch on hook sets. Then, an ultra-thin steel leader should be attached to that. The thin nature of the wire leader also creates the illusion that bait is not at all connected to line and it’s much more thin than the tip-up line. Finally, red treble hooks. Now, I’ve done a lot of different testing over the years and haven’t found much of a difference, but on this day, for whatever reason, the bigger fish were biting on the baits with red hooks. Some days, small changes like these may help the bigger fish bite. Second, when you find a pattern that works, stick to it. There’s an old saying, “Don’t leave fish to find fish.” If you’re on quality fish, there’s no reason to move on to look for something elsewhere. That day, I continued to think that someone was going to find a trophy fish on the end on their line. After seeing three others in our group pull in keeper pike, including a 29” fish, I was starting to think it just wasn’t my day to get a keeper. 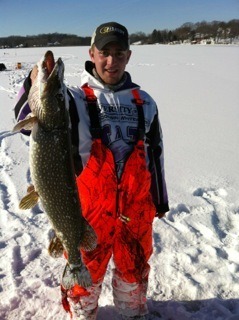 Granted, I had caught two other short pike that day, including one on an ultra-light jig rod with 2lb test, what a fight! Once we started getting all our tip-ups in the right depth, area and rigged correctly, we were catching fish! Quality equipment also makes a huge difference. Whether it’s hooks, line, leaders, tip-ups and even bait. Make sure you’re using the right stuff. Sharp, strong hooks can make the difference between getting a fish in or not. Be sure to check trebles just as if you were throwing a crankbait out on the boat. Also, be sure to use a hook with a strong steel shank to prevent the hook from flexing or breaking. It’s important to get deep hook penetration on the first pull when hand lining. Check your line after each bite or catch. Any frays or nicks should be corrected right away. You should do the same with your leaders. Don’t skimp on strength too much BUT you don’t want to overdo it either since we don’t want the fish to be able to see the leader. Lastly, tip ups. This is one area I’ve been fighting with for a long time, and my buddy Carl Gretenhardt at Provide Outdoors is going to love that I say this but here goes nothing… Beaver Dam tip-ups are the way to go! I’ve been fishing with and defending the abilities of Frabill Pro-Thermal tip-ups for the past two years, but I think the moving parts and components aren’t as good as the Beaver Dam’s. They work much better in the bitter Wisconsin cold, don’t freeze up, and will last much longer. They do cost more, but it’s definitely worth it — they last a lifetime! There were hot streaks of multiple flags within an hour, and times where we sat and drank beer for, seemingly, hours before we scampered to the next tip-up that was spinning like a top. All in all the fishing was hot, the beer was cold, the company was great and memories were made. 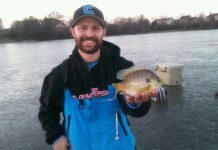 Get out there, whether it’s the frosty, mid-west ice scene or the open waters of the south. You can’t put a trophy on the wall while sitting on the couch! 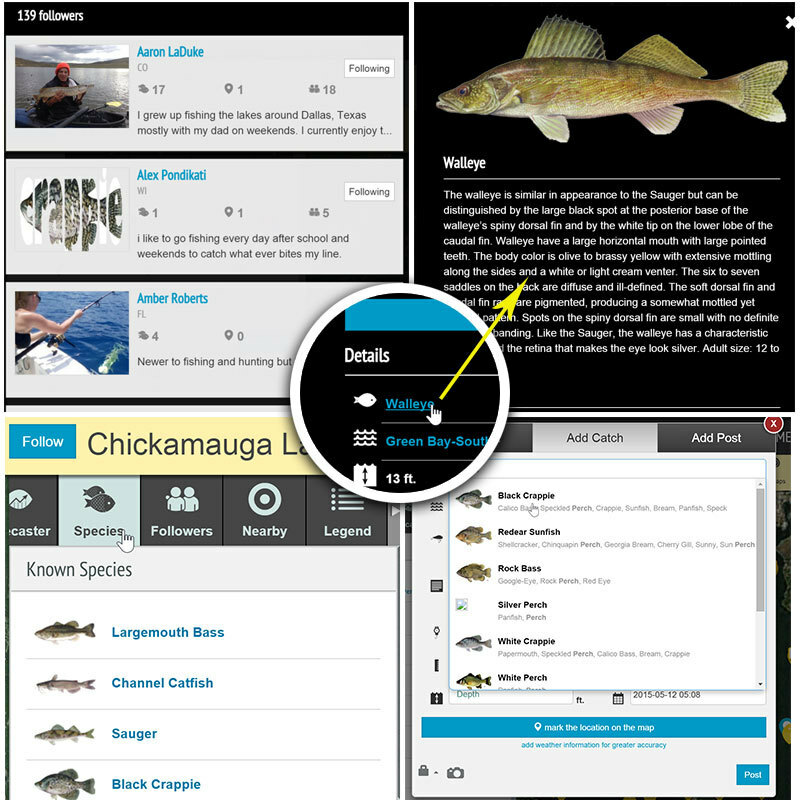 Don’t forget to log on to Fishidy.com, check where the bite is in your area, and drop some knowledge for other anglers!